Best of the Week: A&K desktop amp/DAC, CES 2018, VPI Prime turntable and more | What Hi-Fi? 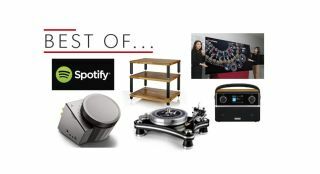 A round-up of the week's highlights, including a possible 88in OLED from LG and a review of a VPI turntable. This week we learned LG is to unveil a whopping 88in OLED TV at CES 2018, Astell & Kern announced the L1000 hi-res desktop amp/DAC and Spotify found itself in a spot of bother with a copyright lawsuit filed against the streaming service. For reviews, the new year has started with a bang in the form of VPI's Prime Signature turntable, Atacama's Apollo Storm 6 rack and Roberts' Stream 94i radio. MORE: Win a Cyrus One amplifier, Chromecast Audio dongle and Tidal subscription! OLED, 4K and HDR made an impact in 2017, but barely a few days into the new year, LG has set its sights on something bigger. Next week at CES 2018 in Las Vegas, LG could be about to reveal the world's largest OLED, which will also be the first 8K OLED display. Little else is known about the set, but it may herald the way ahead for TV manufacturers over the next few years. The new year hasn't got off to the best of starts for Spotify, with the news that the streaming service is facing a $1.6bn copyright lawsuit from Wixen Music Publishing. The lawsuit alleges that Spotify has streamed tens of thousands of songs from artists including Tom Petty, Neil Young and Tom Morello, without a license or compensation. It's not the first time it's faced (and settled) such a claim, but this latest one looks like it could result in hefty compensation. A&K is aiming to make a foray into desktop audio space with the announcement of the L1000 hi-res desktop amplifier/DAC. It's an eye-catching piece of design with 2.5mm, 3.5mm, 6.5mm and XLR audio outputs, plus speaker terminals and a USB input. The A&K ACRO L1000 will be available later this month, priced at £800. "It takes everything the standard model does and builds on it"
VPI's Prime turntable was a confident-sounding package and the Prime Signature continues that trend. The presentation is bold and insightful, the deck's rhythmic ability and sonic organisation are both impressive. Less so is the turntable's tonearm, which is prone to wobbling. The Signature builds on the strengths of the Prime and for that it comes highly recommended. "The company has created another class-leading support with a hefty saving on its Award-winning sibling"
The Storm 6 is more affordable version of the award-winning Evoque 60-40 Special Edition rack, but cheaper doesn't necessarily mean a drop in quality. With a sturdy build and excellent support and isolation, it helps your hi-fi kit to shine. We can't find a deficiency with it, making this another talented performer from Atacama. "The Stream 94i is the complete package, and that makes it the best radio (for its price)"
The Stream 93i was a popular effort, winning a What Hi-Fi? Award for three years running, so the 94i has a lot to live up to. Thankfully it rises to the occasion and improves upon its predecessor, with an enjoyable sound, useful features and modern design. It's the complete package and currently the best radio at its price.